Arthur Turner is a mid-season English cooking apple, primarily used for baking. It cooks to a sweet yellow puree. Arthur Turner has probably the finest blossom of any apple variety. Sorry we have not been able to produce any trees of this variety this season. We may still be able to propagate it to order for you. Please contact us for more details. Use / keeping: 2-3 weeks? Drying / Discoloring: Very oxidising? Arthur Turner is in flowering group 3. Arthur Turner is self-sterile and needs to be pollinated by another tree of a different variety nearby. Since it flowers in the middle of the blossom season it can be pollinated by most other apple trees. 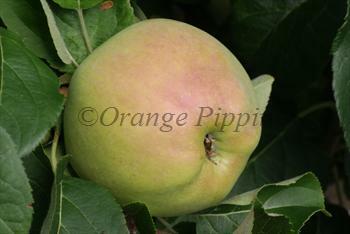 Arthur Turner is a reliable garden apple variety, needing minimum attention. Raised in the early 20th century by Mr Charles Turner of Slough. Unknown parentage.